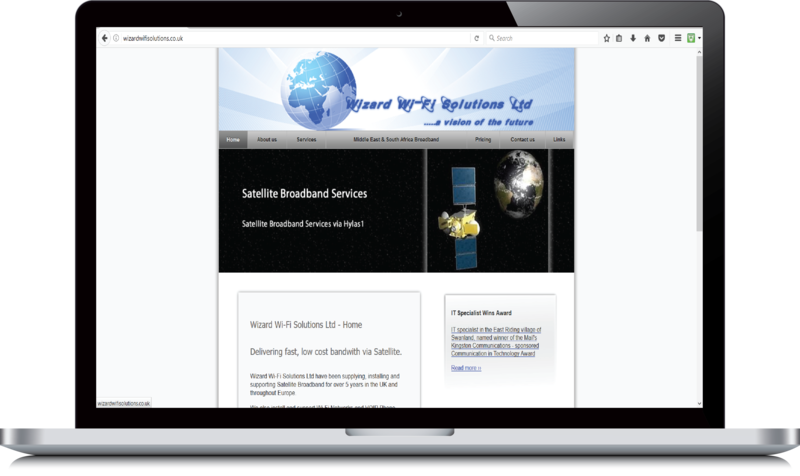 Wizard Wi-Fi Solutions Ltd, based in Hull, East Yorkshire, supply, install and support Satellite Broadband in the UK and throughout Europe and have been doing so for over 5 years. They also install and support Wi-Fi Networks and VOIP Phone Systems and have developed Internet, VOIP and TV solutions services in Spain. Wizard Wi-Fi Solutions Ltd are approved by Avanti Plc (approved resellers in the UK), to supply, install and support Avanti Satellite services and are also a supplier of Dell Computers. The company were in need of a new look website from their previous one. Wizard Wi-Fi Solutions needed something that was more up to date and representative of the company today. The previous website had not been updated for a few years and no longer fully reflected the company's products and services. WebTek Designs created a new design for their website which brought it right up to date. Incorporating new company logos and branding, the new design and layout now reflects their current products and services.